I'll never forget my flight from Kathmandu, Nepal to Lukla Airport in the Himalayas. Trekkers to Everest base camp (on the Nepalese side) usually fly to Lukla to save time and energy. Unfortunately, this means embarking on a small plane that lands on a very short runway. Uphill. And on your return, taking-off downhill, off a steep cliff. 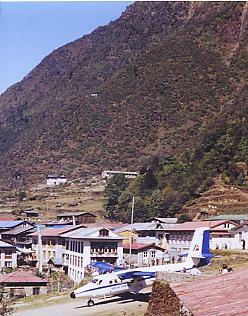 Lukla Airport has been called the most dangerous airport in the world, and there have been many crashes and fatalities there. You can spend hours waiting in Kathmandu airport for the weather conditions to be suitable, but many flights to Lukla are delayed or cancelled. The airport has a spectacular approach - and the flight from Kathmandu exposes you to the incredible panorama of the Himalayan chain. Lukla itself has an elevation of 2,860 metres. The runway is 460 metres long, 20 metres wide with a gradient of 12%. When I asked "why" the runway is so steep, I was told, "Because it's short. The angle helps the plane slow down when it lands, and pick up speed to take off." And at the end of the runway, there's a steep drop of 610 metres into a valley. Comforting, isn't it? In 2008, the airport was renamed Tenzing-Hillary Airport - in honour of Sir Edmund Hillary and sherpa Tenzing Norgay: the first men to summit Mount Everest. [Below, photo from Wikipedia] The side view of the slope... and the type of twin-engine plane used. If any of y'all are thinking of heading over there, I would suggest going in Autumn (October-November) when the weather is more stable and predictable. It will be a lot colder, but this means the skies are clearer, giving you a better view of the mountain peaks, and more importantly, better weather for the flight to Lukla. Otherwise, you can just walk from Kathmandu. I can totally understand why this would be considered a scary ride! That tiny strip of landing space you captured aerially really gives it a sense of scale. Michael Palin decided to give up on his considerable comedy talents to make those dreadfully tedious travel shows. Have you ever tried to watch one?